Churning butter was an important part of the summer’s activities in the Gaelic economy, since dairy produce was a large part of the daily diet. Butter-making was hard work and if the cows weren’t getting enough to eat, they wouldn’t be able to produce milk that was fatty enough to make butter properly. The process could therefore be a little uncertain at times, and so – just as with any other aspect of the work day – both milking and butter churning were tasks that were heavily laden with traditions and charms that helped things along. When it came to churning, the churn dollies would often be made of special woods like rowan, or else hoops of rowan were wrapped around them, to help protect against witchcraft.6 Salt or silver was typically thrown into the milk before churning began,7 and if anyone came to visit whenever butter was being made at Bealltainn, it was traditional to take a turn. Besides helping spread the load, it showed that the visitor bore no ill-will to the household on such a potent day, and so if the butter failed no suspicion of the evil eye or witchcraft would fall on them.8 Should witchcraft be suspected at any point, there were a variety of counter-charms that could be used, too. As the butter itself was churned, a charm was also usually sung. There are all kinds of charms that are recorded from across Ireland, Scotland, and the Isle of Man, and they all tend to concentrate on encouraging the “lumps” or, in this case below, the “store” to come; in one instance the lumps are addressed as a’ chailleach bhuidhe – “the yellow cailleach” – showing her presence once again. Thig, a storrach, thig! Come, store, come! 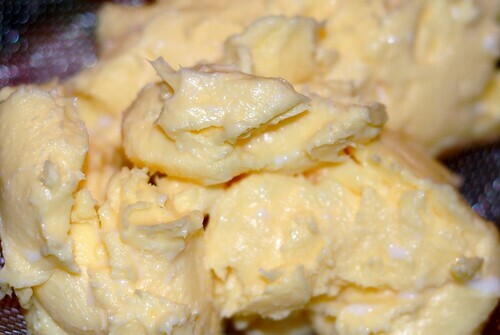 During the churning process the butter will come very suddenly, with the lumps of butter separating out quickly. Once the butter has formed large clumps you can stop churning. You’ll need to separate the butter out from the liquid (the buttermilk) and then strain the excess liquid out; you can do this using a sieve and a spoon until the liquid stops coming out. You might also want to flavour your butter with some salt. The leftover buttermilk can be used in baking (they make excellent scones and pancakes!) or as a refreshing, creamy tasting drink in its own right. 1 The Irish viewed the annual milking cycle as 90 days of full milk in May, June, and July (3 gallons); and ninety days of one third of that (1 gallon); 90 days of about one quart daily; and ninety days of no milk, starting in January. Patterson, Cattle Lords and Clansmen, 1994, p131. 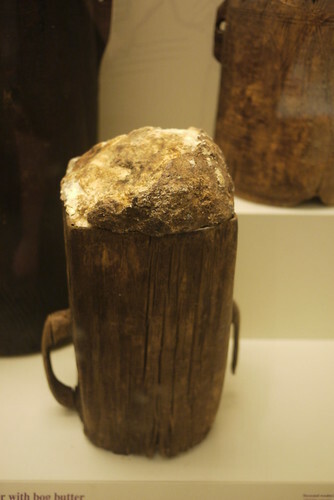 2 A Brief History of Bog Butter, Smithsonian Magazine; Kelly, Early Irish Farming, 1997, pp326-330. 3 Lucas, Cattle in Ancient Ireland, 1989, p58. 4 Simpkins et al, County Folklore Volume VII: Fife with some notes on Clackmannan and Kinross-shire, 1914, p16. 5 McNeill, The Silver Bough Volume 2, 1959, p65. 6Wood-Martin, Traces of the elder faiths in Ireland, 1901, p156. 7 McNeil, The Silver Bough Vol I, 1957, p153. 8 Evans-Wentz, The Fairy Faith in Celtic Countries, 1911, p43. 9 Carmichael, Ortha nan Gàidheal/Carmina Gadelica Volume 6, 1971, p8. 10 Evans-Wentz, The Fairy Faith in Celtic Countries, 1911, pp37-38.